If we want to be precise, we will say that the Earth has a shape of a geoid, which sounds weird. “The Earth has the shape of the Earth”. Seriously? Does this really explain something? Anyway, for many calculations we use a sphere as a decent approximation. Places on this sphere we can describe as having a latitude and a longitude. Latitude changes if you go from north to south, or the other way around, and longitude changes if you go from east to west. This is how latitude goes – horizontal “cake layers” from north to south; and how longitude goes – vertical “orange slices” from west to east. Now, since the Earth is a sphere, and longitude changes as you walk along the equator, or along any arbitrary latitude “ring”, strictly maintaining the longitude, sooner or later you will come to the point where you started walking. This “start” line from north to south, going through all latitudes, is called “180th meridian”. If you want, you can think of it as of a place where you “stitch” the Earth. 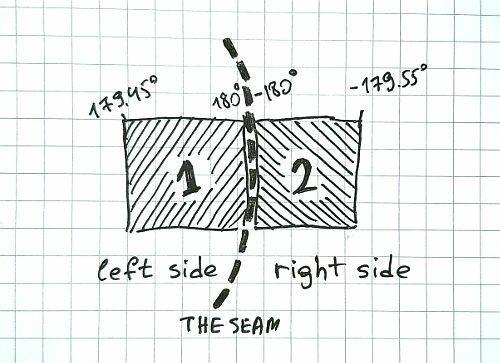 It is sort of a seam – for coordinates. 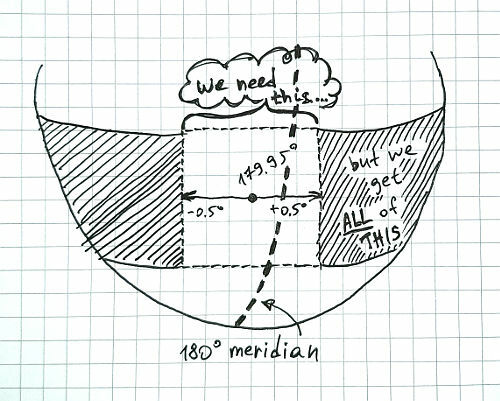 180th meridian, a vertical line along one of the longitude “slices”, acts like a seam: coordinates on the “left” go up to 180 degrees, and coordinates on the “right” start from -180 degrees and increase. Until it’s 180 degrees again, where it must wrap again. The longitude on west side of the “seam” goes from -180° to 0° and then to +180° again, where it meets and itself again from the eastern side. It is precisely the 360-degree circle. Neat. Now, what does it all have to do with Fiji, you’re asking? This is the code we had. We got the hotel point, built a bounding box around it, which is simply a range of coordinates a bit to the east, west, north and south, and searched for airport points in this range. # This is the point of the hotel around which we'll look for airports. # This is how we calculate the bounding box - range of coordinates - for querying airports around the hotel. # which has columns "latitude" and "longitude". and the radius is 0.5? Awesome, should work perfectly fine, shouldn’t it? This is the code we’ve had for years. and the radius is still 0.5? Here we have longitude that is invalid. The Earth only can get from -180° to +180°, right? There cannot possibly be more than this number of degrees in a circle. We need a piece of code fixing that. # Of course, same goes for longitude_west. Hmm. Something is wrong here, for sure. When you wrap your longitude this way, your query will go crazy! It will capture the whole world except for the place you need! Imagine that! Like a goldfish told you you can have everything in the world, but only not that thing you want the most. Crazy, huh? 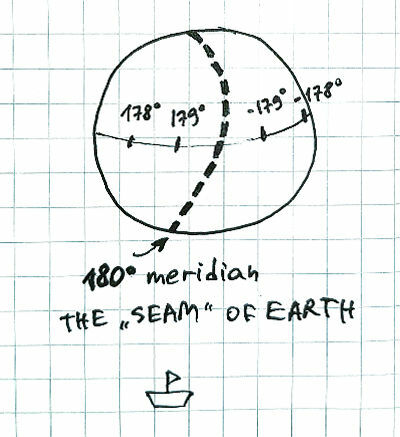 There are only several countries that are located very closely to the 180th meridian – the “seam” of the Earth. Fiji, New Zealand, Russia, Kiribati are the countries that have territories on both sides of the “seam”, very-very close to it. Fiji is particularly noticeable because people live quite close to this line there. Also Fiji has three dots in one word in a row. Can it get better than this? Because of that, it would be wise to use existing libraries and databases supporting geospatial data. The standard called OGC, developed by Open Geospatial Consortium, advises to take close-to-sphere Earth shape into account. (Not flat!) Lots of libraries written in many languages support this standard and are great in all aspects. JTS Topology Suite – a java library. NetTopologySuite – a .NET library. Shapely – a library for Python. Microsoft SQL Server with Spatial data types. Postgre with special spatial extensions. Pick a database with spatial extensions. Create your Airports table with a geometry field. And boom! The database has handled everything for you. No worries about the weird Earth shape at all! I fixed this little cute bug several times in my life in different projects. Yesterday I couldn’t fix it in the usual way. We have a very old codebase and a very huge database, both of which cannot possibly be rewritten only by me. We store the airports data in a simple table with two columns for geometry: longitude and latitude. Of course, the database has no way of knowing that these fields are supposed to be spatial and handled smartly. And the developer who wrote the code many years ago didn’t think of this problem. So if you, like me, already have a ton of code in a language without an OGC-compliant library, store data in the database without spatial extensions, and just want to fix this small thing – there is a way too. What we need to do here – is to check whether the new bounding box is split by our “seam”. If it is true – then we’ll make two bounding boxes. # This is what we have at the moment. # Yes, there is the seam. # Let's have two conditions for each side of the seam. Doesn’t the same apply to latitude? Latitude goes from -90° to +90° degrees and not a single step more. This means latitude queries will suffer exactly from the same problem – if you query anything around the poles.